It’s NOT About Flash ! So, we just announced the Direct Availability phase of our array and the amount of interest we got was overwhelming, we are truly excited about what we are bringing to the marker and we’ll share more when appropriate but let me start with a provocative statement, our product is NOT about FLASH, yes, it’s kinda late here but no, im not mistaken and despite the fact that Passover just across the corner, we didn’t drink the 4 glasses of wine just yet. forget about FLASH, we are NOT selling FLASH! FLASH is our engine, similar to the combustion engine that was invented in 1858, FLASH was invented in 1980, there are many type of FLASH devices. the engine itself was a product, but just as an engine it wasn’t that important, similiary to FLASH which is also a product, but this product is limited in read / write cycles, VERY expensive etc`..
in 1885, came an interesting usecase for the combustion engine, the first vehicle that is actually powered by the engine, basically, Daimler and Maybach took a bicycle and put the engine in it which made the bicycle faster and easier to run. similarly, storage vendors (us included) have tried to take a traditional array and put FLASH in it, other tried to just take core FLASH devices, put them in a box and as an afterthought, tried to make it an enterprise array as oppose to just a dumm and fast data mover. in any one of these cases, a modification was required in order to fit the FLASH, faster CPU’s, read / write conditioning treating etc`, just like the bicycle that had to be tweaked to hold an large / heavy engine, in a nutshell , MINOR MODIFICATIONS. a few year afterwards, two completely new guys, the Wright brothers had the same pieces of information and equipment in their warehouse, they had bicycles and combustion engines but they thought of something completely different, they didn’t try to mix again between the two technologies, they asked, how can we leverage this new technology to do something that is totally new and they came up with…the airplane. they basically said, we have an engine now, we DON’T need these wheels, we can replace them with wings. we don’t needs the transmition, we can replace it with a propeller and we can FLY. if that sound familiar, that because you probably saw back to the future and the famous phrase “roads?, where we going, we don’t need roads” got stuck in your brain..
the XtremIO array lookd very similar on the outside to those arrays in the photos above but on the inside, it’s something totally different and it’s not a good comparison but as an industry and humans, we tend to think in numbers, how much faster it is etc`. 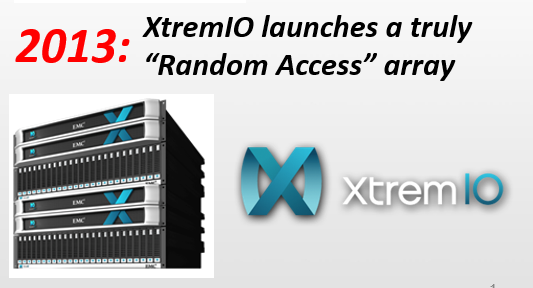 XtremIO compared to the other arrays is like comparing the airplane to the motorcycle, it’s something that is completely different, it was designed differently and it works differently. 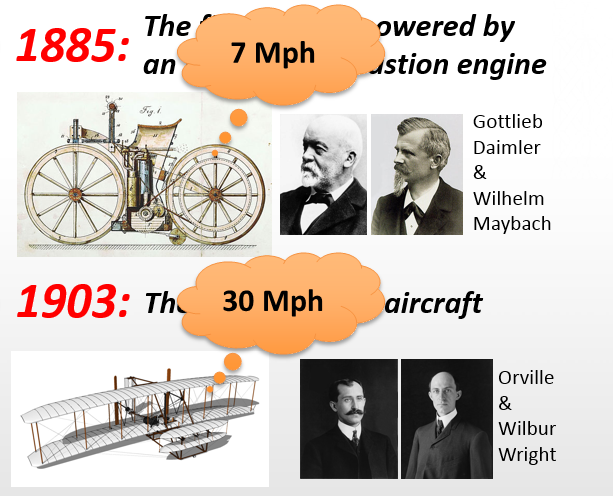 to drive this point down, let’s take a look at the speed numbers of these two vehicles above, the first motorcycle could go 7 Mph, the first airplane at it’s first flight went about 30 Mph but no one in their right minds will go and sell this airplane by claiming that it’s 4 times faster, you can see it’s different, the speed comparison isn’t valid, they both are a mean of transportation to get you from point A to point B.
these are both storage arrays, they both store your data, that where the comparison ends. the motorcycle is much closer to a bicycle than this airplane is closer to the motorcycle. 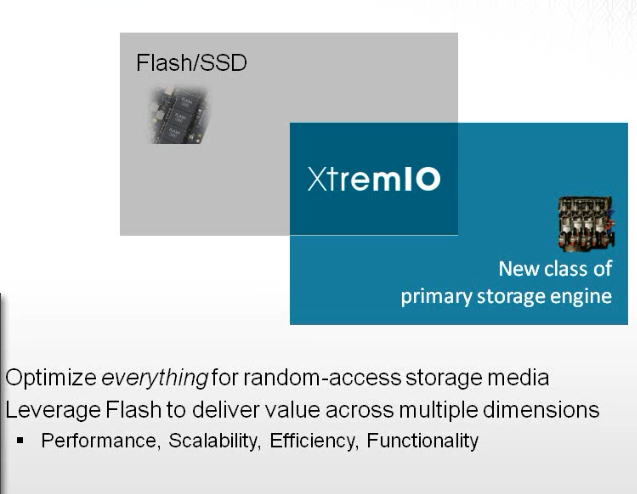 in the same way, the competitors storage arrays is much more closer to a traditional hard drive arrays than it is to EMC XtremIO array. this is EXACTLY the difference between us and other experimenters, we try to see how can we do things differently, better, simpler, using this new enabling technology, what they are trying to do is make this enabling technology as fast as possible. paradoxly (back to the future again), when you do things better, you are going to be FASTER without having a faster engine. it’s not about the speed of FLASH. FLASH is great, it will be with us for many years, it’s not the end goal, it’s a transitioning technology that the only thing we assume with it is that it’s providing us random access, all the future technologies that will come will guarantee the same characteristic, RANDOM Access and that is the ONLY thing we care about, it’s the only assumption we are taking the FLASH itself. we built this array from the ground up to provide efficiency, efficiency comes from different angles, inline deduplication, deduplication for snapshots, completely different and new RAID scheme, performance and functionality, all of these things are different because the media is random access. for each one of these foundations we are doing things differently and that is what makes us better. Functionality – in the same way we are doing things differently today, we guarantee they will be different tomorrow not just compared to hybrid arrays but also to other All Flash Arrays because of their inherit age of the way they are using FLASH. Happy Easter / Passover holidays everyone! I wanted to acknowledge the person who came with the analogy but he wanted to stay anonymous, so thank you !